Irish baby shoes for a baby girl feature green shamrocks; they are ideal for an Irish Christening. These Irish baby shoes have a lacy satin finish that feature green shamrocks. 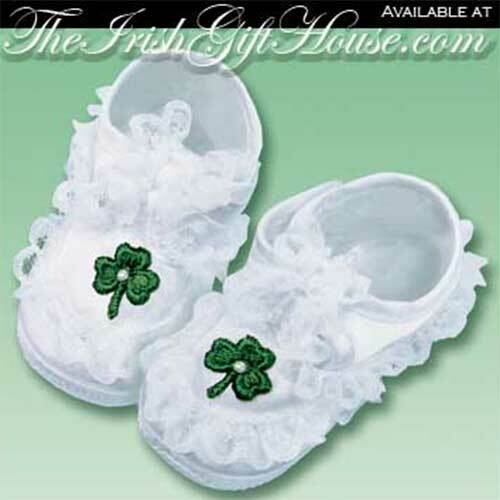 The girl's shamrock baby shoes are a white t-strap style with button closures. The Irish Christening shoes are gift boxed with a shamrock history card, complements of The Irish Gift House. Irish baby shoes for a girl feature green shamrocks; they are ideal for an Irish Christening. Irish baby shoes for a girl feature white shamrocks; they are ideal for an Irish Christening.